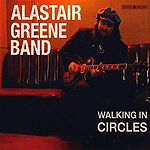 CD review: "Walking in Circles"
Southern California blues veteran Alastair Greene plays a stripped-down, no-frills brand of electric blues and blues rock. The 11 tracks on his latest album, "Walking in Circles," remind more than a little of the carefree abandon found on George Thorogood's first few releases. The band is tight and plays the mix of originals and choice covers with obvious joy, the rough edges of their playing part of the charm. Greene is an impassioned guitarist, with a nice touch on slide. As singers go ... well, he's an impassioned guitarist, with a nice touch on slide. But as with Thorogood  another singer no one will ever confuse with Al Jarreau or Frank Sinatra  the overall experience is somehow improved by Greene's less than polished vocals. He and his band have that gut-bucket feel for the blues that lets them tackle a song like "Give Me Back My Wig" by Hound Dog Taylor and pull it off with the same sort of bravado Taylor had.